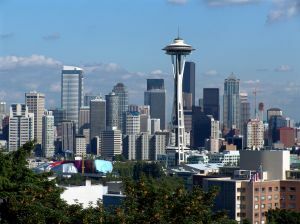 Commercial real estate in SeattleWith interest rates now at historically low levels and the United States economy growing at a strong pace, many business owners have been considering the purchase of commercial real estate for their business locations. The benefits and drawbacks to commercial real estate ownership vary from business owner to business owner but potential buyers should educate themselves about the obvious and sometimes hidden benefits to the ownership of a commercial property. Below are some of the major benefits to ownership as opposed to leasing a commercial space. For many business owners one of the primary benefits of commercial real estate ownership are the tax deductions that can be taken on the interest portion of the monthly commercial loan payment. These deductions can be substantial and each business owner should consult a qualified tax specialist about their unique situation. On average, commercial real estate properties will appreciate about two to three percent above inflation over the long term. This equity appreciation can result in significant financial gains over a period of decades. Many small business owners will not receive a pension when they decide to retire. The equity appreciation on commercial property can be significant. An owner can decide either to sell their property at retirement, cashing in on equity appreciation or lease it to another business for a continuous retirement income stream. In fact, in many situations, a business owner may be able to lease out an unused portion of his property, such as a spare office, before retirement for additional income. As opposed to residential loans, many commercial loans are assumable. This makes the business and real estate much easier for a buyer to acquire and enhances the value of the business tremendously. When a business leases their real estate they must pay sales tax on the rent paid to the landlord. When you own the real estate there is no tax to pay on the rent. The savings can be significant. Great fixed rate loans for terms up to 30 years are now available for owner occupied commercial properties. In fact, in some instances, with strong financials, a business owner may qualify for loan financing up to 100% of the purchase price for his commercial real estate. Business owners should consult an experienced commercial mortgage adviser before making an offer on a commercial property. In addition to the easily tangible benefits outlined above the business owner who purchases a property to house his business location will be able to have the satisfaction that only comes with ownership and he won't be making his landlord rich. Ted Karsch is a nationally recognized financial adviser who specializes in the financing of commercial real estate. He can obtain commercial financing for all property types with loan amounts ranging from $100,000.00 to 50,000,000.00. He welcomes any comments or questions from readers at his website http://www.combasefinancial.com Or enquiries can be made to his email at Ted@comabasefinancial.com He can be reached by telephone at (561) 401-5646. Please call or email today if he can be of assistance to you in helping you obtain commercial financing.